Ever since geoscientists and engineers started using seismic waves to figure out what lies under our feet, seismic reflection technology kept improving and today most oil-rich sedimentary basins have a wide coverage of high-quality three-dimensional datasets. In addition to finding structures and locations in the subsurface that are likely to be filled with hydrocarbons, these huge data volumes can also be used to reconstruct landscapes that are long gone from the Earth's surface. After all, stratigraphy is what is left behind from an ever-changing topography, and it is a mistake to think that stratigraphy can be understood without knowing a few things about geomorphology and landscape evolution. 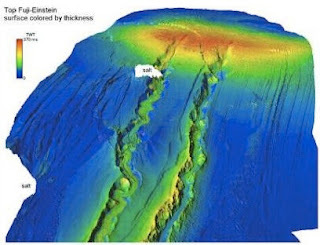 Seismic data confirms that the past, indeed, is not that different from the present: if you peek (that is, listen) into these volumes of rock, you see ancient meandering rivers and submarine channels, deltas, barrier islands, mouth bars, and estuaries. However, in addition to and beyond the excitement of seeing another beautiful example of a sinuous channel or other depositional and erosional features, a lot remains to be learned from the true and large-scale three-dimensionality of these datasets. For a geologist, there is no other data type that offers such a degree of three-dimensionality. Even the largest outcrops offer only random two-dimensional sections through a system; the temptation is strong to convince ourselves that we can extrapolate to get an idea about the third dimension, but more often than not we are probably wrong, at least in the details of our extrapolation. This is actually worse than the case of "The Blind Men and the Elephant"; it is more like the blind men and a random cut through the elephant (but I will stop this chain of analogies right there). Long story short, I (re)started to blog about this subject because there is going to be an SEPM research conference in Houston, a conference that focuses on using three-dimensional seismic data to better understand how sediment moves or gets deposited on continental slopes. It should be an interesting collection of talks and papers. The image above is from the conference website and announcement; it happens to come from a paper that I am going to present, on a shelf-edge delta and its related slope channels in the Gulf of Mexico (the higher-resolution version is coming soon...). Colors represent thickness (red is thick, blue means thin). There are two leveed channels taking sediment from the shelf-edge delta into the deep ocean.